Cameroonian footballing hero Roger Milla, the oldest goalscorer in World Cup history, is taking on an even bigger challenge in a very different field—turning plastic waste into building materials. 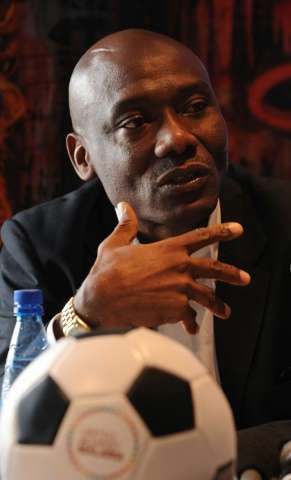 The man named the best African player of the 20th century last year embarked on a quest to resolve Cameroon's massive plastic waste problem. With plastic bags and bottles routinely cast away in the central African country, the waste clogs up rivers, litters roads and blocks gutters. "We launched this project to fight pollution and create jobs for unemployed youngsters," Milla, who is now 63, told AFP. The problem has become so bad that in 2014 the government banned "the making, importing, selling or distribution of non-biodegradable plastic packaging". 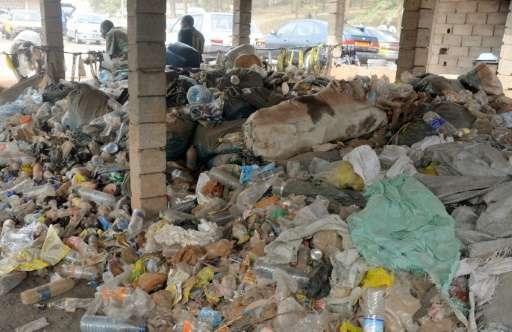 But some producers resisted, and earlier this month 100 tonnes of plastic packaging were illegally produced and seized in Cameroon's largest city Douala. Milla, who rose to international fame in the late eighties and early nineties for his trademark goal celebration of a dance by the corner flag, is now creating a new band of followers. He is forming what he hopes will be a 2,500-strong team of youths to collect and sort plastic waste, the raw materials for his modern alchemy. The project is being carried out under the banner of Milla's Coeur d'Afrique (The Heart of Africa) association for children, and its new off-shoot focusing on the environment and sustainable development. "We have selected a first 25 youngsters and have given them comprehensive training" so they can in turn become trainers and induct others, said Pancrace Fegue, the association's executive secretary. 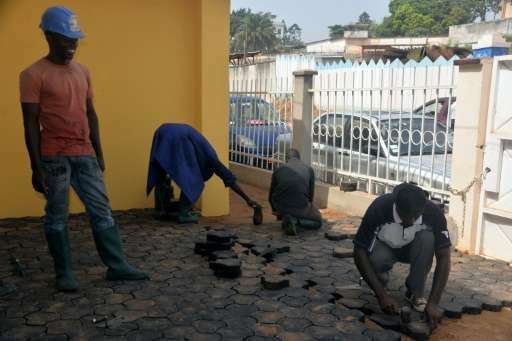 The pioneer group has already produced thousands of paving stones, used notably for the renovation of the Cameroon handball federation's premises. In November, Milla's association raised awareness in two Yaounde schools, inviting students to pick up plastic waste in their areas. Within a week the school-children had collected three tonnes of waste. "We want the pupils and the households to understand that plastic has a new destination," beyond the rubbish bin or the street, said Fegue. "When we get all the recovered waste back to the warehouses, we start sorting through it," explained Pierre Kamssouloum, the project's technical director. Not all plastic is suitable. Anything containing chlorine, for example, is sifted out. Once they've identified the usable plastic, the industrial magic starts. "The plastic serves as a binder and replaces cement," in the production of concrete slabs, Fegue explains. The plastic is melted down in a large tank placed over a wood fire. Sand is then added to the molten plastic and the hot mixture poured into moulds. The process doesn't need water and the product sets and dries at room temperature within 15 minutes, according to Kamssouloum, as opposed to the 24 hours for the normal sand and cement based product. Nor do the advantages stop there. "Our paving stones are cheaper," Kamssouloum said. 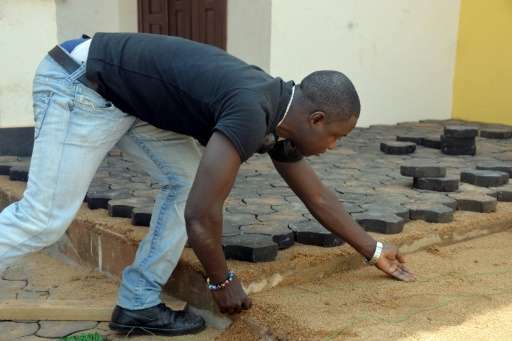 They cost 3,500 CFA francs (five euros, $5.40) for a square metre that is five centimetres thick, while the usual cost is 5,000 CFA francs. The new slabs are waterproof and can be used in marshy areas or even to build septic tanks, he added. Labogenie, a national laboratory tasked with testing construction materials, said the slabs showed "encouraging results", but that further testing was needed. "The results we've obtained on the issue of these paving stones' capacity to absorb water are interesting," said Paul Mallo Nkongo, Labogenie's chief analyst. "The idea of recycling plastic waste is beautiful (and) this initiative would allow us to get rid of some waste material," he added. Milla hopes the project will also help street children re-enter society. "This project can help me cope better," said Elvis Kake, one of the children involved. While the environment ministry has pledged it would help by handing over waste non-biodegradable plastic packaging, the project still faces several obstacles before it can take off. Vehicles to collect rubbish and funds to train the youngsters are still needed, Feugue says. The city has offered the group a temporary production site, but further down the line the project will need a more permanent home.